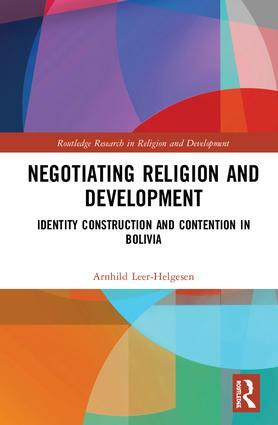 This book argues that relationships between religion and development in faith-based development work are constructed through repeated processes of negotiation. Rather than being a neat and tidy relationship, faith-based development work is complex and multifaceted: an ongoing series of negotiations between theological interpretations and theories of human development; between identities as professional practitioners and as believers; between different religious traditions at local, regional and international levels; and between institutional structures and individual agency. In particular, the book draws on a deep ethnographic study of Christian faith-based development work in the Bolivian Andes. The case study highlights the importance of seeing theological interpretations as being firmly embedded in local religious and cultural systems involved in a constant process of identity construction. Overall, the book argues that religion should not be seen as homogenous, or either 'good' or 'bad' for development, instead we must recognize that institutional faith-based identities are constructed in many ways, formal, theological, and interpersonal, and any tensions between ‘religious’ and ‘development’ goals must be worked through in an ongoing recognition of that complexity. This book will be of interest to researchers working in development studies and religious studies, as well as to practitioners and policy makers with an interest in faith-based development work. The Routledge Research in Religion and Development series focuses on the diverse ways in which religious values, teachings and practices interact with international development. While religious traditions and faith-based movements have long served as forces for social innovation, it has only been within the last ten years that researchers have begun to seriously explore the religious dimensions of international development. However, recognising and analysing the role of religion in the development domain is vital for a nuanced understanding of this field. This interdisciplinary series examines the intersection between these two areas, focusing on a range of contexts and religious traditions. We welcome book proposals on diverse themes such as faith-based development organisations; religious players in health programming; proselytization and development; religion and the environment; gender, religion and development; religion and post-colonialism; and indigenous communities and development.